Sgt. 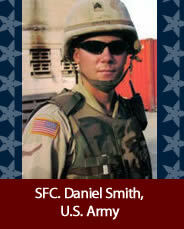 1st Class Daniel Smith, U.S. Army, age 32, died Oct. 24, 2009, from injuries sustained in a civilian skydiving accident during off-duty hours while he was attending law enforcement training at Fort Leonardwood (Missouri). He was assigned to the 391st Military Police Battalion of Columbus and a veteran of the Global War on Terrorism (GWOT).